Watford Football Club played in the Southern league from 1896 to 1920 and become a member of the Football League in 1920. They didn’t reach the first division until 1982 for the first time. The best accomplished result in the top league is a second place in 1983. In the FA Cup, they have as best been runner-up (1984). 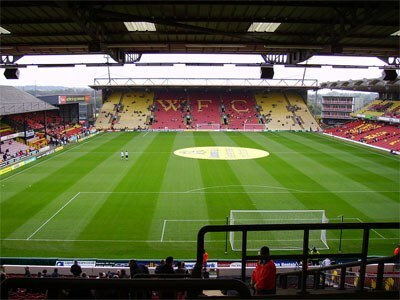 Vicarage Road, home of the Watford team since 1922. The club was founded in 1881 as Watford Rovers. It later changed the name to West Hertfordshire in 1893 and finally to just Watford in 1898.